HubSpot is an all-in-one marketing software application that allows you to optimize your WordPress website to help generate and easily convert High quality leads. HubSpot is used by the site owners to upscale traffic generation, capture leads, automate nurturing and improve sales conversion. With revenue of US$ 513 million in 2018, HubSpot has cemented itself as a force to be taken into account in this space. HubSpot packs its own content management system, however, most marketers do not realize that HubSpot integration with WordPress is possible through a plugin that gives you an easy way to continue using WordPress as your CMS while integrating HubSpot into your site for your marketing efforts. 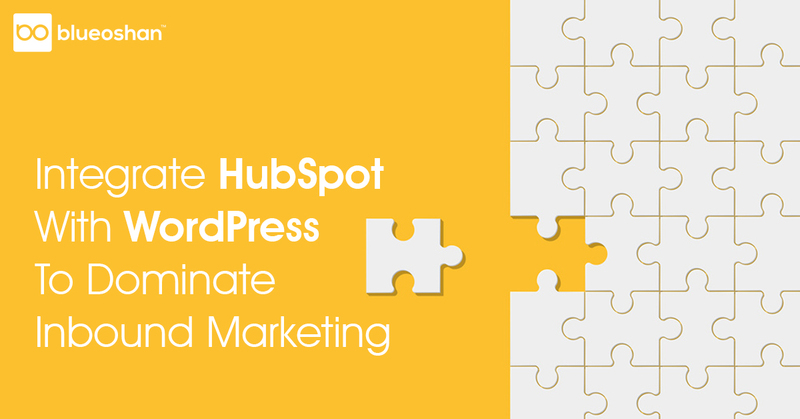 Why Should You Consider Using WordPress Integrated With HubSpot? How to install the WordPress plugin. Use HubSpot to improve your SEO. Use HubSpot to generate leads on your WordPress site and track them. How to successfully implement the integration. By the end of this article, you will have a firm grasp on how to leverage both HubSpot's marketing power and WordPress's flexibility. The enormous amount of flexibility it offers is one of the things we love about WordPress. There's not much you can't do with thousands of open - source plugins. But it can be helpful to have everything neatly tied together, with all your data in a centralized location. For inbound marketers, HubSpot does that. HubSpot's inbound marketing framework can help you create more traffic - seeking WordPress website, attract more visitors, turn those visitors into leads, turn those leads into customers, and turn them into brand promoters. There are some plugins that can help you do these things, but your data is going to be scattered across a variety of platforms. You can have everything you need in a single location with HubSpot to run powerful inbound marketing campaigns. Now, let's get into some simple ways to enhance your WordPress site using HubSpot. Install the official HubSpot plugin from your WordPress dashboard (which has over 30,000 active installations and is supported by the HubSpot team). Note: To function properly, you will need a HubSpot account for the plugin. Once the plugin is installed, your HubSpot account will start to extract the data from your WordPress site. Our HubSpot certified integration specialists can carry out multiple integrations on a host of platforms. You can identify which keywords you already rank for using the HubSpot keywords tool, as well as get suggestions for additional keywords. Besides displaying standard metrics such as monthly volume, keyword difficulty, and approximate CPC, HubSpot also displays specific marketing metrics such as the number of leads generated by organic search traffic. If you are struggling to determine which keywords you should target, the suggested keywords tool will allow you to type in a single keyword or URL and then get a list of possible keywords. If you are trying to compare organic content from a competitor, the URL function can be particularly helpful. Just enter your URL, see what keywords are coming up, and then determine whether you should develop content around any of those keywords. Finally, HubSpot will show you low difficulty keywords that you already rank for on SERP 2 - 10 under the recommendations tab. You can probably move these pages to Google's first page with just a little work. The on-page SEO optimization recommendations from HubSpot can help you improve SEO and existing content rankings. If you're trying to move a piece of content to Google's first page, it's a must to follow these recommendations. There's more to SEO than optimization, but it's definitely a good starting point. HubSpot makes it easy to place lead generation forms across your WordPress website in key locations, and then A / B test those CTAs to see which one performs best. You can start moving prospects through your funnel by implementing lead generation forms throughout your site and track their performance. For instance, if you have a list of best tips for optimizing a website, you could give readers a significantly expanded version of the list as a downloadable document in exchange for their email. Test standard pop-up versus email capture forms for lead generation and see which one works best. It's easy to start nurturing a lead through your funnel once you capture a lead and track their behavior. You can create email drip campaigns for your leads within HubSpot and then track the response of the leads. You can determine, which pages your leads are visiting, how they arrived, and where they are in your marketing funnel. This sort of analysis allows you to identify the buying intent of specific leads and customize your interactions based on where they are sitting in your funnel. I recommend adding a HubSpot call - to - action to your WordPress website on each page. You can easily see which calls - to - action generate the most clicks and leads using the plugin. Wherever you use a WordPress form, replace it with a HubSpot form. You can do this with the HubSpot embed code. This will enable you to trigger automation and workflows based on the submission of the form. Set up your HubSpot email automation based on your website's form submissions and conversions. This will enable you to genuinely maximize the value of integration with HubSpot. You'll also be able to see quickly which channels drive not only the most visits but also the most leads and customers. This is critical for analyzing your inbound marketing strategy to ensure that you are optimizing your strategy to match your business goals. Identify the SEO fruit that is low hanging. Determine which pages are already ranking, which pages can be ranked with some improvement, and which keywords you can easily rank for. Then, optimize and improve existing pages and create new content that ranks for keywords with low difficulty. Talk to BlueOshan’s HubSpot implementation and integration specialists to understand how we can help you get the best out of your WordPress website.